Valentine's Day happened to be on a weekday this year so we had our pre-Valentine's dinner at our favorite Japanese Restaurant last Sunday. And yesterday, I prepared a special four-course dinner for us. Want to know what that is? 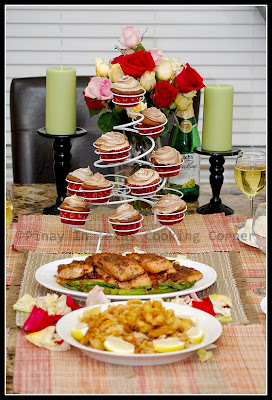 We had Calamares(Deep Fried Squid Rings) for appetizer, Crab & Corn soup, Salmon and Asparagus in Garlic Butter Sauce for the main entree and Marble Cupcakes for dessert. The soup and the main entree are my original recipes and has become my family's favorite. My eldest daughter, Clarise requested for a Salmon dish and my youngest daughter, Cherlin requested for Calamares. So I decided to make an all seafood dinner...except for the dessert of course. Check out the recipes and let me know what you think!